We are located in Great Dunmow, Essex (10 minutes away from Stansted Airport). We are therefore ideally placed to service all major locations on the South of England and to the Anglian regions. 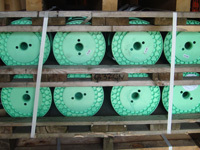 By using our own vehicles for most bulk deliveries, we can ensure our products are safely delivered to you and also ensures that our empty reels are regularly collected, which is often a cause of concern. Where we cannot deliver by our vehicle, we can pack and ship your wire in parcels weighing upto 25 kilos each or deliver on standard euro pallets with wire weighing upto 1200 kilos. Orders above 1200 kilos can be organised for collection from our warehouse.